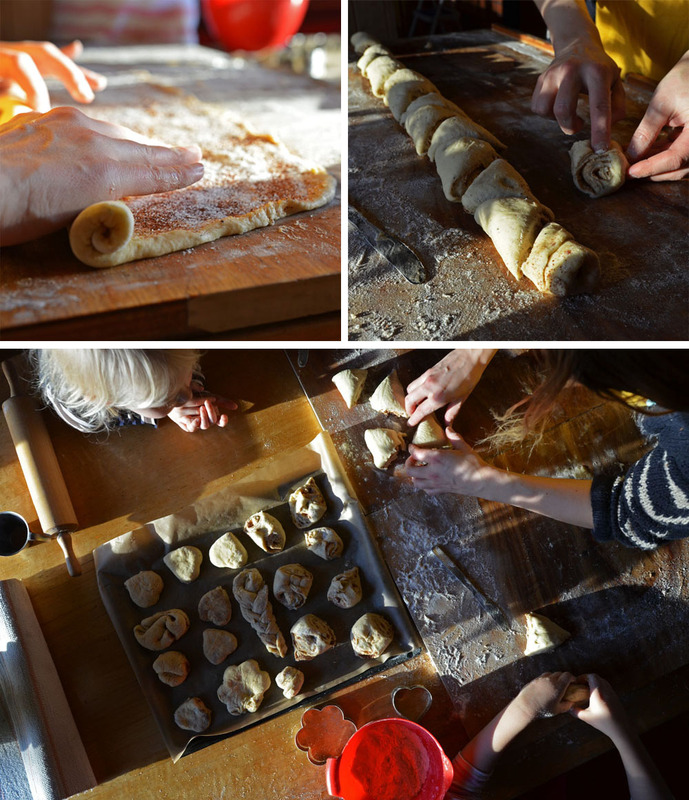 Here it is – the long-awaited recipe that has been on many of my readers’ wishlist: recipe for traditional Finnish cinnamon rolls, “korvapuusti”! If you are familiar with cinnamon rolls from before, you already know that his recipe includes pretty much everything that is usually not recommended by health enthusiasts – just like the simplest (and the best) rhubarb pie recipe that I wrote about last summer. At least if your read health and wellbeing publications or listen to dietitians, the message is “no refined sugar, no wheat flour, no butter” – all those are ingredients that are essential in the making of cinnamon rolls. I totally agree with Dr. Fogelholm! Everything in moderation, right? 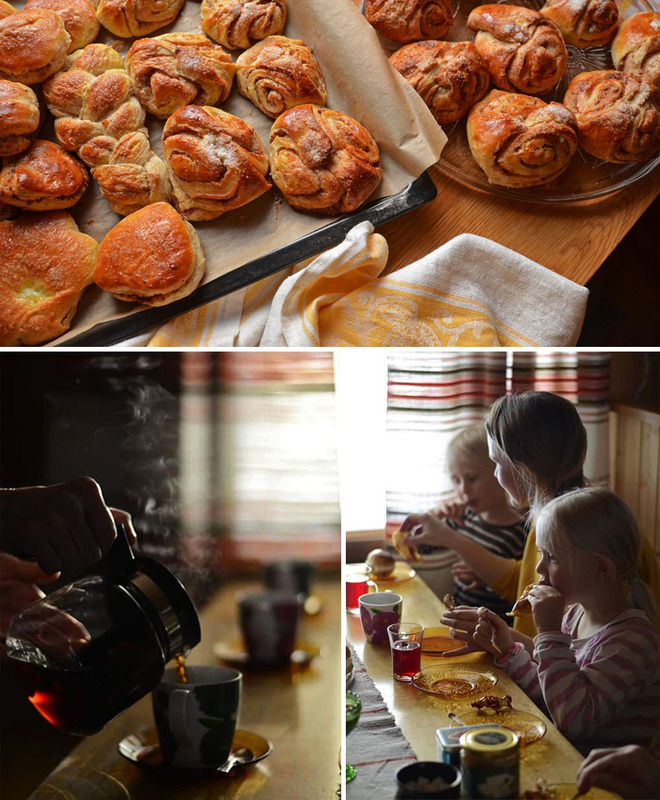 That is why I’m publishing this recipe with proud and joy and I hope that you will get to taste the wonderful flavor of Finnish cinnamon rolls one of these days. And most importantly – when you do, enjoy them to the fullest! 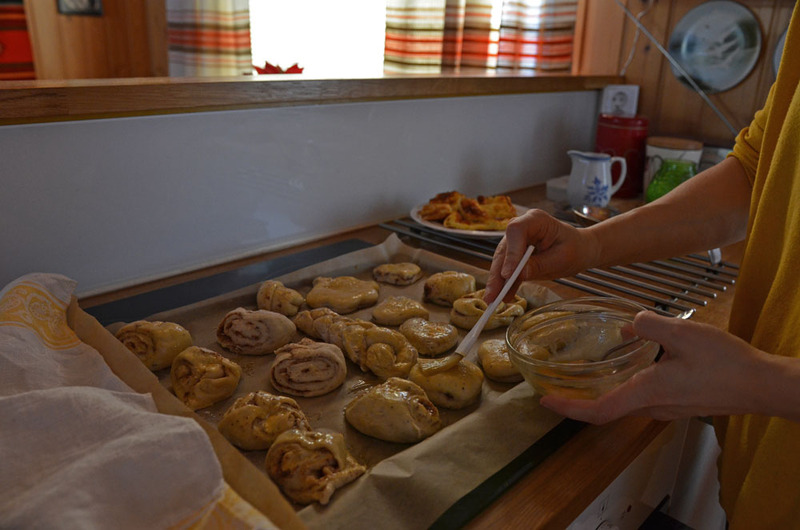 Our family bakes Finnish buns and cinnamon rolls maybe five or six times per year. We love fresh buns, but when you don’t eat them too often every time feels special! 1. Start by taking butter to soften in room temperature about an hour before you start to make the dough. 2. Warm up the milk so that it’s luke warm. Sprinkle in the yeast and blend. With dry yeast milk needs to a bit warmer. 3. Add sugar, egg, cardamon, salt and about 3/4 of flours. 4. Put your hand in the dough, add the softened butter and start kneading the dough. Add the rest of the flour little by little while kneading. 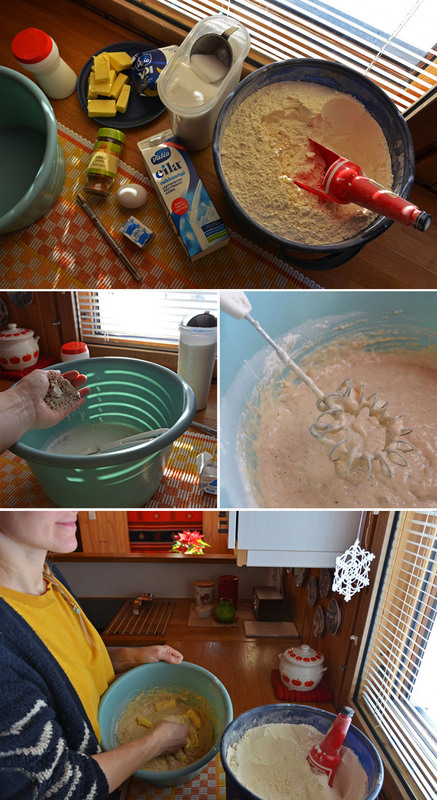 Please note that kneading the dough is a very important part of making the cinnamon rolls! The more you knead, the fluffier the dough gets. Patience pays! 5. Knead dough until it is smooth and a bit bouncy. The dough is perfect when you can remove it from the bowl so that it does not stick to the edges too much. If it does, add a little bit of flour and knead a bit more. 6. Raise the dough in a warm spot under a cloth. Let it raise for about 45 minutes to 1 hour until it has doubled its size. 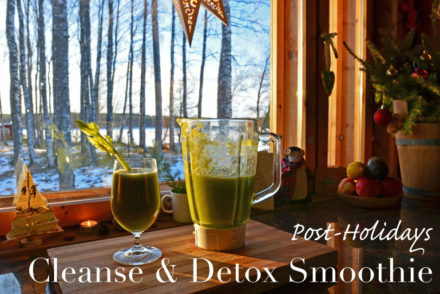 SaimaaLife tip! I usually put the dough bowl into a bigger pan with warm water because warm temperature makes the dough raise faster. This time our dough was left to raise in the warmth of the sun and our grandma’s wood-fired stove. 7. As the dough is raising, take the butter to be used for the filling from the fridge and let it soften in room temperature. 8. Lightly flour a clean work surface with all-purpose wheat flour. Pour the dough to the table and split it in three parts. 9. 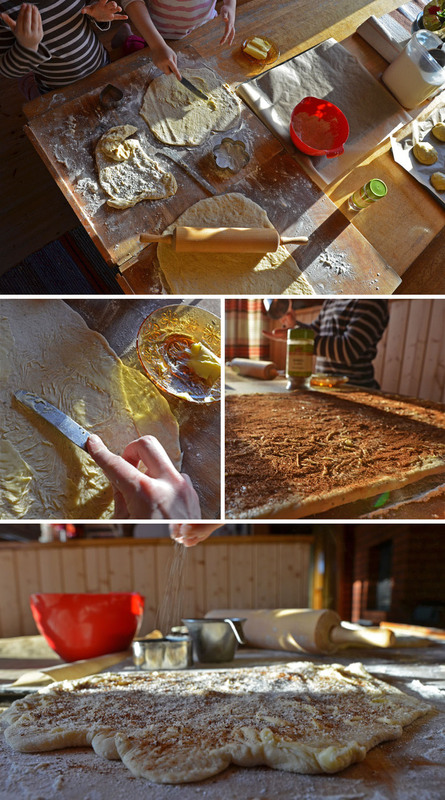 Using the rolling pin, roll the dough out to make rectangular sheets (about 30 x 50-60 cm). 10. Spread the softened butter with a knife on each of the dough sheets. Sprinkle cinnamon and sugar on top of the butter layer. Did you know that there are two kinds of cinnamon? If you are a cinnamon lover (like me) and you use it often, try Ceylon cinnamon even though it’s a bit more expensive. Here you can read what’s the difference between Ceylon and cassia cinnamon. 11. Roll the dough sheet into a tight roll and leave the seam underneath the roll. 12. Cut the roll into to a triangle-shaped pieces. 13. Place the pieces on the table the narrower side facing up. Use your thumb to press the top of the pieces all the way to the bottom. 14. Lift the ready buns on the baking tray (use parchment paper to prevent sticking) and let them raise under the cloth while pre-heating the oven to 225ºC. 15. When the oven is ready and the cinnamon rolls have risen, finish them by applying egg with a baking brush. Decorate the cinnamon rolls with sugar crystals or fine sugar if you wish. 16. Bake in 225ºC for 10-15 minutes. 17. The cinnamon rolls are ready when the color turns into golden brown. Some like them lighter, some darker – try and see which one works best for your taste buds. That’s it! 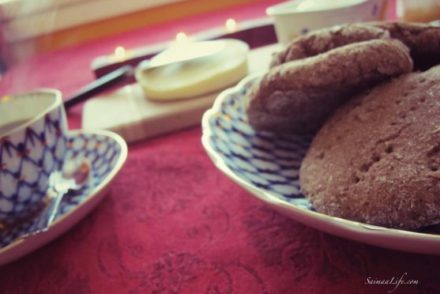 If you want to enjoy the cinnamon rolls Finnish style, make some coffee or tea and invite your friends over for a delicious treat! How to make the most out of your cinnamon roll moment? 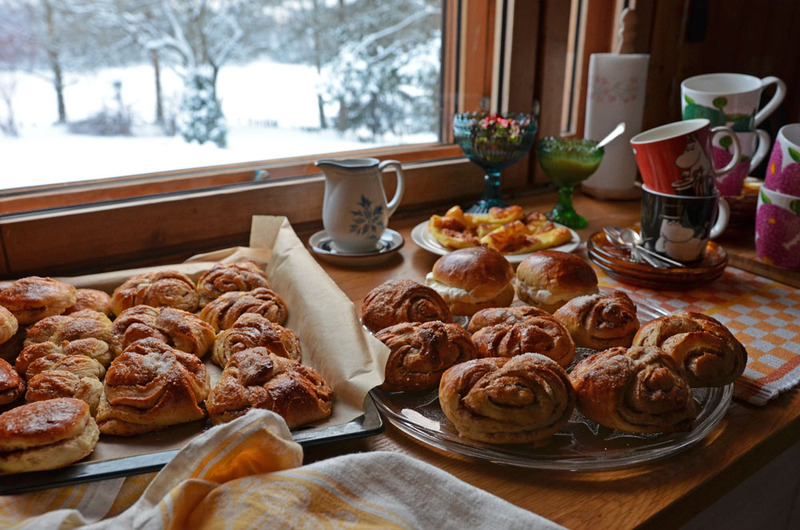 It has been proven many times (ok, maybe not scientifically but you get the point…) that fresh Finnish buns and cinnamon rolls taste even better if you eat them after spending some time outdoors. 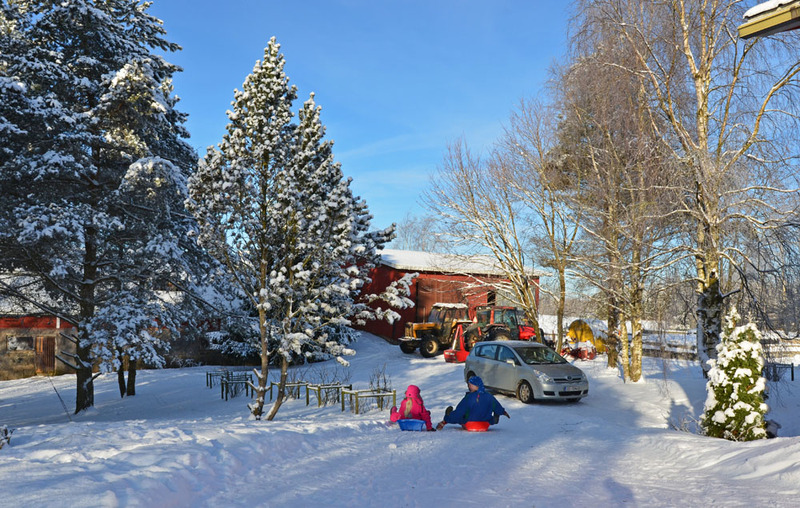 So go for a walk, jump on your skis or ride a sledge with the children – do what you like to do outdoors and then enjoy your cinnamon rolls. They will taste so good! Trust me, it’s worth it. This time we enjoyed the cinnamon rolls together with my parents and siblings. Besides cinnamon rolls, we baked also something else. 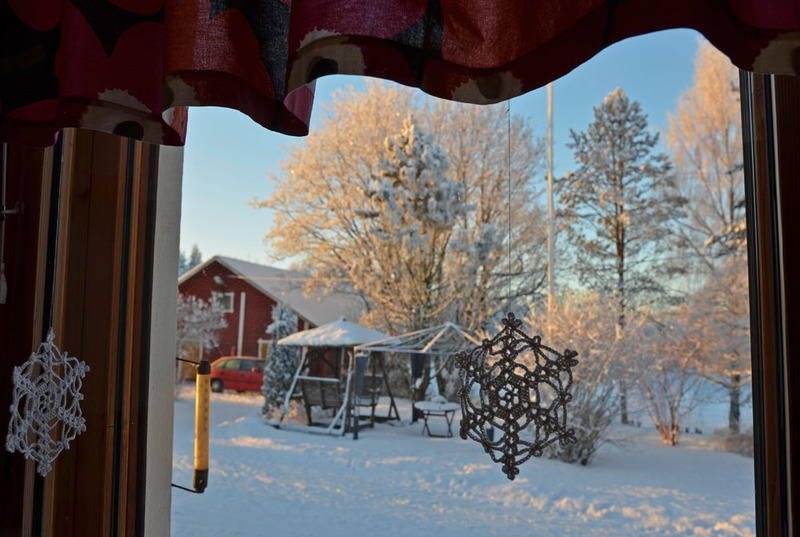 Watch the following video about our winter weekend in the Saimaa countryside and you see what they are! 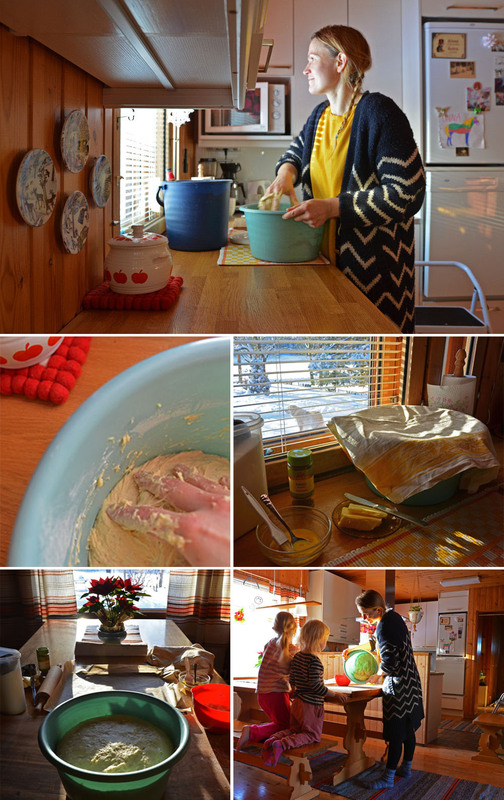 It’s called“Laskiaispulla” (Shrovetide bun) and here’s an article and recipe how to make them! You can watch this 360° video on mobile by opening this link https://youtu.be/q0iA1OhRprY in your Youtube App. 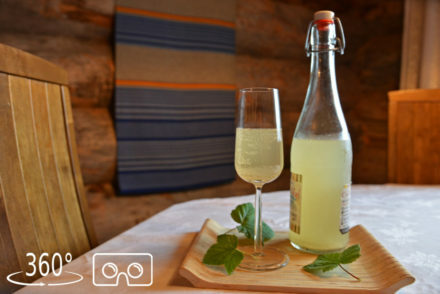 For the best experience, use the virtual reality headset!